Discussion in 'Ham Radio Discussions' started by KL7AJ, Nov 5, 2018. The transmitter in the middle is a WW2-era US Navy TBK (not sure which version). 800 pounds.....and that's just the transmitter, without power supply. The TBK was still in use into at least the middle 60's aboard non combat ships and the "power supply" was a motor generator set a few decks below in the ship. Im still trying to find a good 861 to complete a home brew project which is up to the 860 stage now. Many of the receivers (radios) mentioned are fine examples but missing are the GPR-90, NC-300/303, HRO-500, NCX-5, AN/WRR-2 and 2A which is the true definition of a BOAT ANCHOR and served well in the USN aboard nuclear subs and major surface ships. The semi rare USN RBB and RBC have to be used to appreciate the exceptional RCA engineering and component selection as most Im aware of can be plugged in today without recaps or other work. Their predecessors, also by RCA are the RAK/RAL, about the ugliest radio made, IMO, but also the best regenerative receiver. Another choice on the TX side is the ATC/ART-13, Johnson Valiant, and 500. Plus the engineering marvels the Central Electronics 100V and 200V. Others noted for styling, and not necessarily performance with a few, are the RME 45 and 69, SX-23, SX-25, SX-101/101A, HQ180 (should be listed as HQ-170/180 earlier), NC-200/240D, NC-400, NC-44/46, NC-80X/81X. And yes, Im partial to Nationals altho I also have many Hallicrafters and Hammarlunds in the collection..
And how can we forget the BC-453, 454, and 455 (and SCR versions) which were immensely popular with the new Novice and even higher class hams even into the 60's and have been resurrected again by active collectors using them on the air without mods along with the corresponding transmitters which also saw duty as straight TX, VFO's, and the basis for one of the most popular QST construction articles, the W2EWL SSB exciter. You mention a lot of old great rigs, Rx and Tx. Most of them I know, but a few I will have to look up. I, too, was partial to the old National gear, and Hammarlund as well. 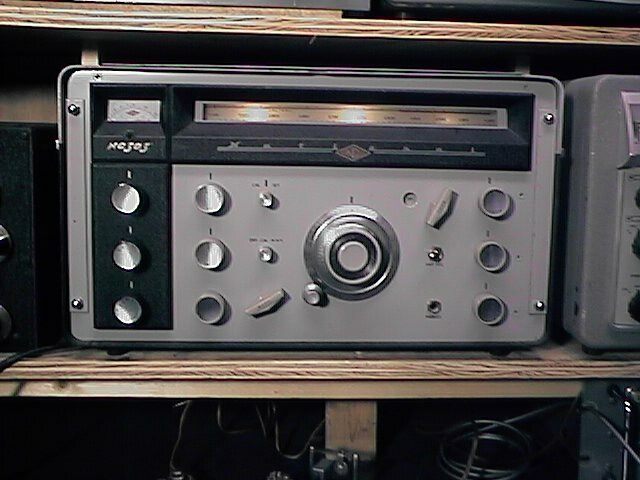 At one time back in the early 1990s I had a vintage station consisting of the HX-50 and HQ-110, and an NCX-3. It was fun running that old gear. Wish I had kept it. As a kid I dreamed of getting an NC-303, but it was way beyond my means. But, it was a nifty dream. To me, nothing is more "radio-ey" than them old heavy buckets of iron. NL7W and N3AWS like this. As a kid I had to make do with a HB regen in 53 which started it all by hearing all the AM SW and hams and then learning the code on it from W1AW and later on the CW traffic nets. The Novice arrived in 55. Then there was the modified BC-454 and 455, a SX-25 dog for a short time (I didnt know about bad paper caps back then), then a HQ-129X with a BC-453 for double conversion selectivity plus a Heath QF-1 that I also souped up a bit for 10 and 15. The TX was a HB 6AG7/6L6 for 40/80 to start, then a used Viking Adventurer to a Viking I. Also built 2 and 6M AM TX and converters. Ive duplicated the 129X and V-1 station here. Joined the USN in 59 where I really learned electronics as an ET and left active duty for National in 63 where I worked on most of their oldies plus HRO-500 and NCL-2000 as no one else wanted to touch SS and 2800V ! Still work on those. Also worked part time for two Boston area distributors doing repairs on all brands plus readying trade ins for resale. Also built SB-200 and 220 amps for a Heathkit store until moving to Chicago in 70. Also do my own repairs on the modern gear. It has an onboard FPGA, so not too many parts would be required to build a receiver. The biggest build issue would be writing the software construct and sequencing, also, programming the FPGA. I always loved the look of the SX-25, it really was a cool looking radio. I am surprised to hear about the paper caps being bad though. I realize that today 99 percent of them must be replaced but that radio could not have been more than about 15 years old in 1955. I got my NC-173 in 1965 and it was somewhere around 16 years old and it worked flawlessly. I didn't know paper caps had that high of a failure rate, I only know that they aged poorly. By the time I really got into electronics in the 70's, Mylar capacitors were pretty much the standard and they very rarely failed. I assume you got rid of the radio and I bet you wish you had kept it now. Now, here is what I'm talking about: big, heavy, beautiful, and you don't need a pair of tweezers to manipulate the controls. Yes, I know, we're all different, and some will think it's ugly. That's OK. As a kid, this was my dream receiver. Shoulda bought one a long time ago, back when I was into vintage gear in a big way. Maybe someday, before I croak. W6ELH, NL7W, KM1H and 1 other person like this. I had a mint 303 for awhile but didnt particularly care for it on AM so sold that for a premium since they are low production and went thru a 300 which is still used in the cycle thru que. Well, anyway it was deaf on Band 4 and I wanted it for 15 Novice use and tubes didnt help it; the HQ-129X was a lot better even without mods and I used it for BCB and SWL DX until 1970 when I transfered to Chicago. At National we were automatically replacing all paper caps in the Service Department, and even ones from the 50's were leaky so I "assumed" the same for the older SX-25. I read years later that there was a production or design error in the Band 4 antenna coil. I have a nice 25 here that is a shelf queen only. The NC-173 is the best of the middle price range receivers and a lot of radio for the money. When one went swimming during the Kon Tiki Expedition and survived sales got a big boost. I have one of those also as a shelf queen that I did overhaul so I could compare it with others and use a NC-183 in the que....Im fond of PP 6V6 audio. I only have so much room available for the two boat anchor benches plus shelves. I a very nice NC-173 that I started restoration on but my attention got drawn to other things. I will finish it between now an January but it will most likely wind up on a shelf. I also had a 183-D years ago and wish I hadn't traded it but that's the way it goes. At least I got a nice new pair of Kenwood twins out of the deal. I just can't seem to get as motivated as I used to, a few years ago I would have knocked that radio out in less than two weeks, alignment and all. The 2-receivers that I definitely wish that I had not traded off were 75A-1 serial number 4 and a GPR-90. I had both a GPR-90 and a Collins 32V-3 that a certain operator wanted very badly and I eventually gave in and let him have both. He was the same operator who used to have a weekly schedule, on 160-meters, with another local starting at 7:00 AM. One Sunday, this operator started a transmission that kept going on and on. The other operator finally ate breakfast, went to church, and when he got home the first operator was still transmitting. This other operator finally got to transmit after noon local time! Talk about "old buzzard" transmissions! Another unit, this time a transmitter, that I traded off, which is very rare, is the LTV 70 cm amateur television transmitter. It had a free-running oscillator and ended up with a 5894 in the final amplifier stage. It was limited to 50-watts which, at the time the transmitter was manufactured, was the maximum input power allowed for that band. WD4IGX, KA4DPO, NL7W and 3 others like this.